If you are searching for Cafe Cubano & Curry Leaf at Vile Parle and wondering where it disappeared, then its right in front of you with a revamped image, new-fashioned look and baptized as Theko. 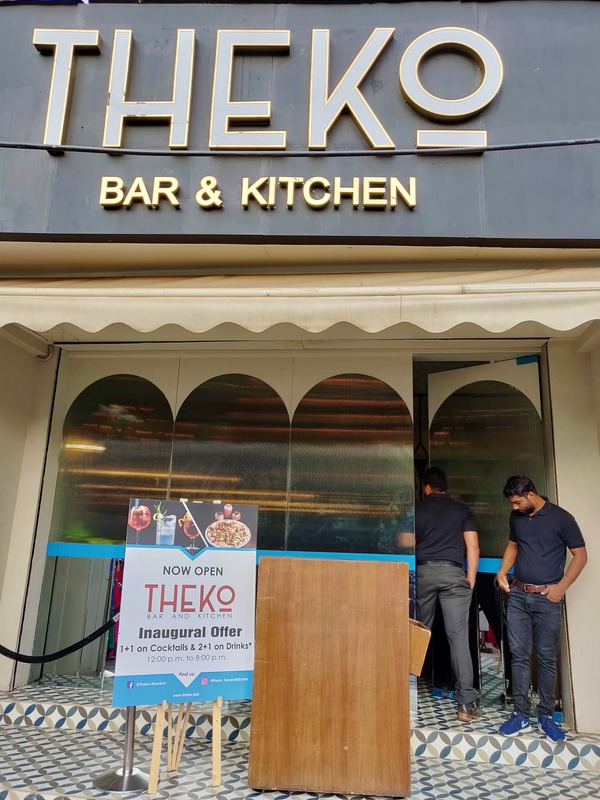 Theko means a drinking place in Gujrati standing amidst the bustling streets of Vile Parle (East) welcoming revellers to sip on their favourite drinks with their favourite food. The small door escorts you to an elegant space poised with serenity. With no dearth in space, the first floor looks bright with partial sunlight, comfortable blue velvet sofas, mirrors, succulent plants and a bar. The stairs lead you to the second floor which displays a unique form of modernism aligned to your mood. Upholstered furniture, retro iron art pendant lamp-in pendant lights, crystal glass studded car and a bigger bar is a copybook of a good time. Try spotting the lion sitting on a king chair smoking & drinking reincarnated as you. The menu looks simple with Indian cuisines dominating Continental & Chinese cuisines. With comfort food on the table, it’s a pleasing experience for all. For drinks, you can have your best shot of beers, whisky, vodka or anything that you like. For refreshment, we had Kala Khatta – Mumbai’s slurpy cooler followed by Kacchi Kairi Twist a blend of raw mango pulp poured over crushed ice. We had our meal started with Stir Fry Garlic Chilli Mushroom looking delectable with battered mushrooms stir-fried with spices. Ghati Masala Paneer Tikka tasted fabulous with authentic flavours from the ghats with soft paneer. For some more starters, we asked for Achari Chicken Bites cooked with pickling spices & chillies. Chicken Tikka Sliders with Asian ingredients & delicious slaw makes them ideal for any occasions. We also binged on Tandoori Jhinga apt for prawn lovers. Not very far from the starters were the main course; Dum Aaloo Kashmiri, Chicken Handi Lazeez, Dal Fry, Muttor Pulav & Onion Cheese Kulcha. The main course is worthy for any day meal with enough quantity & best quality to suffice your taste buds. We had to settle for Caramel Custard the only sweet available for desserts and whoa it was soft & a quick melt. If you want to treat your squad with food & drinks or simply raise a toast, then head to Theko for an amazing evening. The service was slow and the staff seems clueless. Effective training should make them more attentive.